1066 is a strategy game that mirrors conflict in war by placing players in control of an army engaged in a medieval battle. 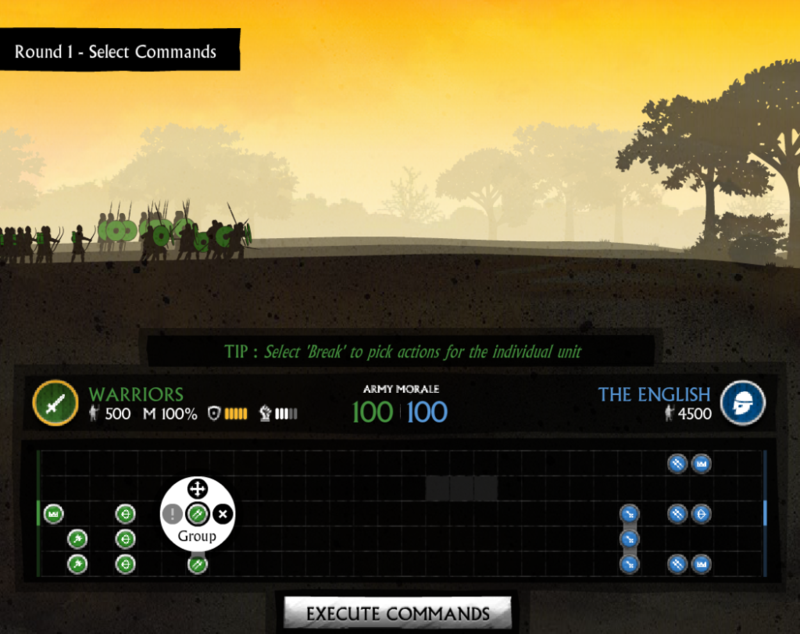 By taking turns with a computer or other players through each round of play, players must make decisions about the formation and actions of their own army as they attempt to defeat an enemy army. The Units listed on the right have different battle capabilities. Play begins by positioning Units into their starting formation. “Army Morale” is a dynamic stat that starts at 100. 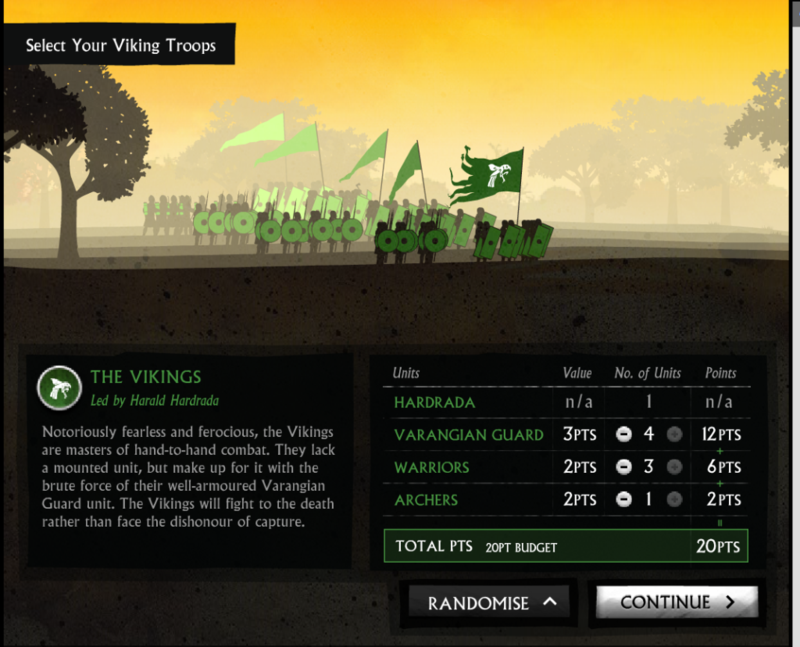 The round icons represent different types of Units, and players can select commands for these Units to execute during each round of play. 1066 was produced in collaboration with a UK television channel to accompany a two-part historical documentary. Its explicit goal was to offer a standalone digital experience that could engage 10-16 year-olds and pique their interest in history. While its interface is relatively simple, the game has high production value, with evocative, atmospheric audio and beautiful animations that drive the game’s storytelling. 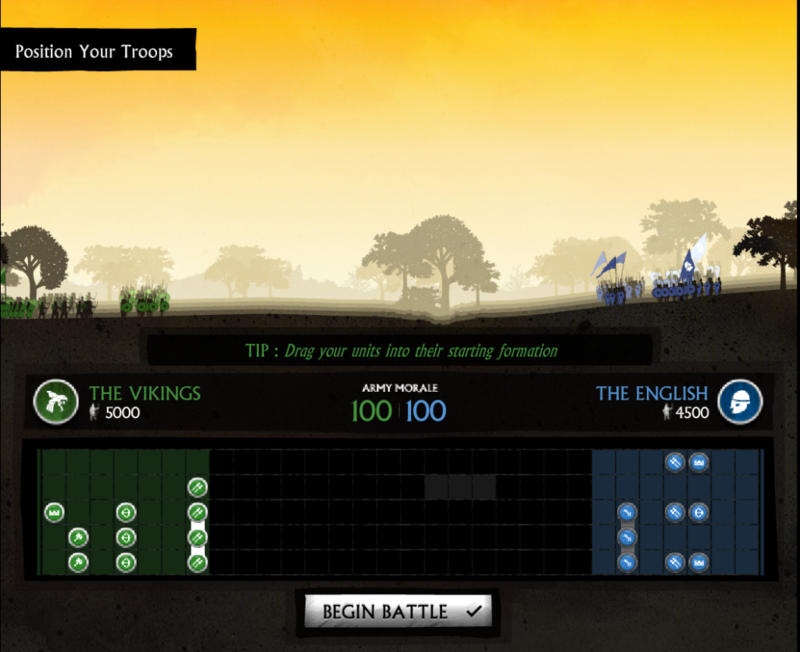 Animations provide context for the game’s central conflict between the English, Normans, and Vikings over control of England, as well as depict the battlefield action that results from a player’s decisions during each round of play. Intense music and battlefield sound effects (including blood spattering and swords clashing) help create an immersive experience, while the armies exchange historically-informed verbal taunts to damage the enemy’s morale. The importance that 1066 places on morale elevates it above other strategy war games that focus solely on the number of enemy combatants killed or damage wrought. 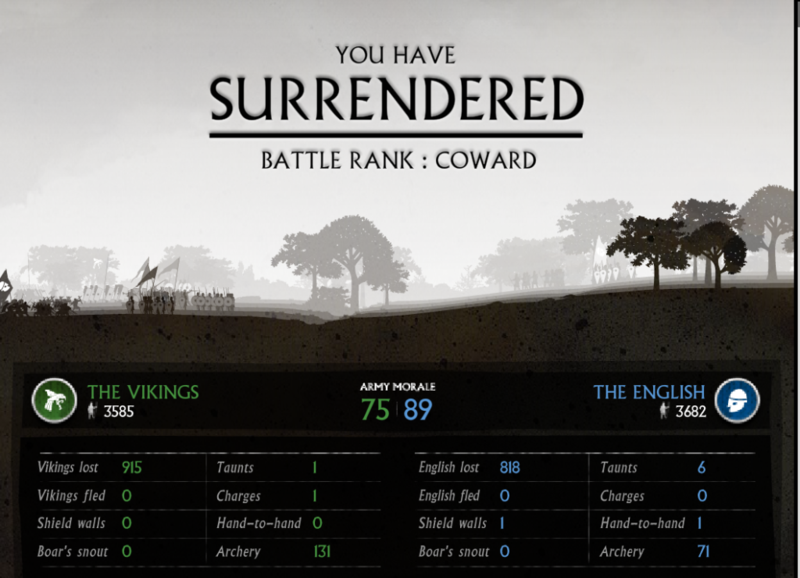 In 1066, the battlefield commands that players execute are not the only important element in an army’s success. Players must be aware of their army’s morale in addition to the results of their own strategic decisions in maneuvering and deploying their troops with different capabilities. The detrimental effects of taunts hurled by the enemy army (as light-hearted, comical, or ridiculous as they might seem to contemporary audiences), make themselves increasingly apparent as an army’s morale stat decreases in response to both battlefield losses as well as protracted taunting from the enemy. In order to achieve success in 1066, a player must combine consistent taunting with savvy strategic choices. Importantly, taunts and their effects on morale call attention to the fact that the troops engaged in these historic, medieval battles, while represented by icons on-screen, were human beings who had emotional responses to the action that was happening around them. While these emotional responses are only examined on a basic, surface level through the “Army Morale” stat on screen, they are nonetheless present for players to consider as they decide how to best deploy their army’s capabilities to defeat an enemy army. 1066 is an engaging game that places players in a decision-making role in a particular historical context. Because of this, it has the potential to serve as a gateway for young people to learn more about medieval history and battle strategy. However, it does not do very much to actually examine how a loss of morale can manifest itself on the battlefield among individuals; instead, it merely recognizes that, in addition to tactical and strategic decision-making, morale plays a role in warfare. Ultimately, the game could go further to connect young players to relevant historical resources and engage them in critical play. One possibility for critical play is encouraging players to think critically about timeless, universal themes around human, emotional responses to battlefield action, which could be a compelling extension for what is currently an “entertaining but hollow” experience. These stats show the effects of the commands a player has executed throughout the game, but they ultimately don’t offer anything deeper. 1066 certainly seems to be more engaging than the Cotton Millionaire game AJ had the misfortune of playing! The inclusion of the psychological element of ancient warfare is particularly interesting to me, even if it is perhaps not the deepest of takes on the subject. Your comment about it ringing rather hollow got me thinking about games that have attempted to incorporate these element in a more critical fashion. I was reminded of a computer game published a few years back called This War of Mine–a simulation of civilian wartime experience based upon the Bosnian War of the mid 1990s. The psychological effects that such an environment has upon player and non-player characters is, from the many reviews I’ve read over the years, an integral component of the game. This game is, unlike your average war-sims, not intended to be a particularly “fun” experience. The intent is rather to force players to consider the horrors of war from a different perspective, that of the civilians forced to live among the gunfire and rubble. It is a game that has sat on my “To-Play” list since release, but one that I have not yet been able to bring myself to download. Hi Sean! Thank you for introducing me to This War of Mine. The perspective-taking aspect (particularly around difficult history) is especially fascinating to me. From the Kotaku review, it seems like a pretty intense experience to inhabit a civilian’s perspective in warfare. I’m more familiar with how people talk about perspective-taking in VR or 360 video, but I think games (and especially role-playing games) can be a powerful tool, especially if critical play is central to the design process. I wonder how the designers discussed trauma, and about the strategies they used to mitigate the risks associated with putting players in traumatic situations. Having tried my luck, I can say that this game feels surprisingly difficult to learn how to play well for something designed to draw in a younger audience! I wonder what sort of playtesting they did beforehand to set things like the difficulty of the archer aiming minigame or what kind of tutorial was provided to new players. Thanks for your comment, Ike! I assumed that I was having difficulty playing the game because of my general lack of experience with videogames (which is probably still a contributing factor), but I feel better knowing that others also found it suprisingly difficult. I also wonder about the design process that Preloaded followed, since it’s clear that the television channel that commissioned the game put a lot of resources into developing the game. In the end, it seems like they may have put more into the media surrounding the gameplay, rather than the gameplay itself. Mirroring Isaac’s point, the game is incredibly difficult to get started with and might not have enough to engage younger users up front. A learning curve is one thing but a gate on accessing the game is incredibly hard to justify. I think, especially in the context of history-based games, a designer needs to be cognizant of the fact that the first few minutes are the most important minutes of any game. Furthermore, historical accuracy aside, the underlying game needs to be attentive to how players actually play. Hi AJ! I appreciate your point about how a high learning curve can be a barrier to access. Good, human-centered design benefits everybody, regardless of age, ability, or any other factors that an inclusive design process must take into consideration. I do think that 1066 does a good job of creating a compelling experience in the first few minutes-it’s just not the game or gameplay that does that work. I think the animation at the beginning that sets the context for the game’s central conflict is exemplary storytelling. After reflecting more on our discussion in class, it seems like 1066 missed an opportunity to include some of that central, historical learning in the gameplay itself. They could have achieved certain educational objectives through play instead of stitching together separate historical narrative components and and the gameplay.